A new center at Wright State University’s Lake Campus to house its fast-growing agriculture program and bolster its water quality research will soon open its doors. A ribbon-cutting ceremony for the Agriculture and Water Quality Center is scheduled for Friday, Feb. 2, at 1 p.m. The ceremony will include Wright State President Cheryl B. Schrader and other top university officials as well as government and community leaders. The 8,190-square-foot-center center, which includes a 680-square-foot portico, is just east of Dwyer Hall. The cost of the project, approximately $3 million, is being bankrolled with $1.5 million in state funds allocated by State Rep. Keith Faber and the rest was raised by Wright State. The building will provide classroom space for the growing agriculture program; a hands-on research and laboratory area for applied learning and research on agricultural and water quality issues; an outreach facility for community meetings on agricultural production, water quality and other issues; and a focal point for partners to work proactively to support the regional agricultural industry as well as water quality efforts associated with nearby Grand Lake St. Marys and local watersheds. The building will include two education classrooms that each seat 24 students and can be combined into one large educational/conference room. Agricultural education lab space designed for diverse hands-on agriculture education activities and research will have seating for up to 24 students. Lab space for water quality research and education will seat up to 12 students. A lobby and conference area will be used as a student lounge and a space for events and conferences for up to 100 people. “It’s going to offer a lot more hands-on learning, having the labs to work with,” said agriculture major Olivia McDade. In 2008, Lake Campus began offering agricultural elective courses that were part of existing degree programs. In response to the desire to build an agriculture program to meet the needs of the community, Lake Campus in the past several years created numerous certificates and degrees in agriculture. Today, more than 65 students are enrolled in the agriculture program. Courses include topics such as animal science, animal health, nutrient management and agriculture finance. Lake Campus offers 11 bachelor’s degree programs, including ones in engineering, business, nursing, education, agriculture and food science, an MBA program and a police academy. 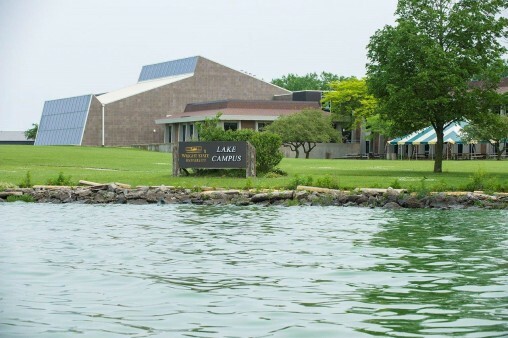 Lake Campus for several decades has studied the chemical and biological aspects of water quality in the surrounding watershed in some capacity. It is currently working on a variety of collaborative projects with academic and government agencies such as the Environmental Protection Agency, Ball State University and Sea Grant to study the mechanisms that drive biological and chemical patterns in the ecosystem. Sea Grant, which is administered by the National Oceanic and Atmospheric Administration, is a national network of colleges and universities involved in scientific research, education, training and extension projects geared toward the conservation and practical use of the coasts, Great Lakes and other marine areas. Lake Campus research into water quality has resulted in numerous grants, publications and presentations and has been used to inform policies to help the region. The campus continues to be involved in bringing the classroom outside by folding students into every facet of the technical water quality research — providing a growing opportunity for active learning and discovery that prepares a new generation of scientists.